Mehmed VI Wahid ed-din (Ottoman Turkish: محمد سادس Meḥmed-i sâdis, Turkis: Mehmed Vahideddin or Mehmet Vahdettin) (14 Januar/2 Februar 1861 – 15/16 Mey 1926) wis the 36t an last Sultan o the Ottoman Empire, reignin frae 1918 tae 1922. The brither o Mehmed V, he succeedit tae the throne as the eldest male member o the Hoose o Osman efter the 1916 suicide o Abdülaziz's son Yusuf Izzettin Efendi, the heir tae the throne. He wis girded wi the Sword o Osman on Julie 4, 1918, as the thirtie-saxt padishah. His faither wis sultan Abdülmecid I an mither wis Gülüstü, (1831 - Mey 1861), oreeginally named Henriet, a Circassian. 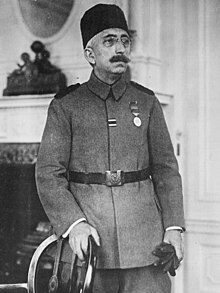 Mehmed wis removed frae the throne when the Ottoman sultanate wis abolished on 1 November 1922. Wikimedia Commons haes media relatit tae Mehmed VI.